Move water out of your sump pit or basement safely and efficiently using this Little Giant Automatic Submersible Sump Pump. 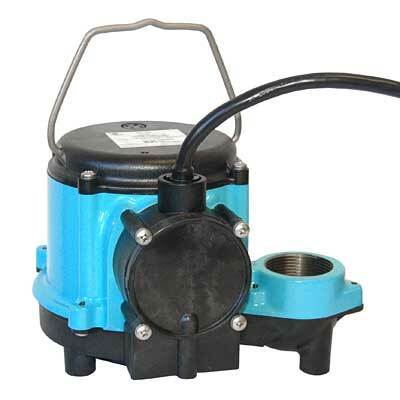 The rugged, cast iron housing with epoxy coating ensures a lasting pump, while its 1/3 horsepower motor will move plenty of water. The screened, bottom intake protects the integral diaphragm, which uses water pressure to activate the unit only when necessary. A top, metal handle makes lifting or positioning the pump simple, while a threaded outlet accepts 1 1/2" MNPT fittings. A 1 1/4" threaded adapter is also included for even more versatility. The dielectric oil inside this fully submersible unit keeps the motor perfectly lubricated and cooled, and the 10' long cord allows you to place it in your sump pit easily. Transfer water from one area to another safely with this Automatic Submersible Sump Pump. Two year limited warranty.